The Media Diversity Institute (MDI) is organising a media camp for 30 participants – journalists, audio visual professionals, and NGO and social activists who will exchange best practices and create innovative media products related to countering online hate speech towards migrants. The media camp will be held in London on 23-27 April as part of the project and campaign #SilenceHate. The participants coming from all over Europe will work in teams and as individuals. They are expected to design at least 10 media products and/or campaigns about migration issues responding to the ethical challenges associated with reporting on migrants. The media camp will be followed by mentoring and sub-granting for content production. Many recent studies show that manifestations of hate speech against migrants and refugees are increasing in Europe. The Italian organisation COSPE gathered eight prominent European organisations under the project and campaign #SilenceHate. The Media Diversity Institute (MDI) together with COSPE, Amnesty Italy and Poland, European Federation of Journalists (EFJ), Karpos, Zaffiria and the Cyprus Community Media Centre will combat and prevent online hate speech against migrants and refugees by developing new and creative counter-narratives. In April, MDI together with EFJ and COSPE will organise the media camp in London as a 5-day training for journalists, audio visual professionals, and social activists in order to build a counter-narrative on migration. According to the #SilenceHate project’s narrative, the most effective way to tackle hatred is through education and debate. The Bild newspaper was chosen as “The Troll of the Month” within the MDI project Get the Trolls Out (GTTO). The aim of GTTO Troll of the Month is to expose racist and anti-religious haters and to show the positive outcomes in the fight against intolerance in Europe. The German tabloid Bild was pushed to change a deceptive and xenophobic headline, after social media outburst accused them of fearmongering. 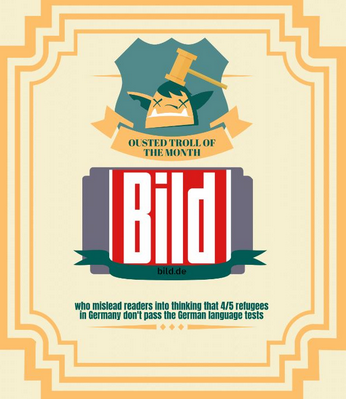 The Bild not only fuelled racism through sensationalistic headline saying “Four out of five refugees do not pass the German language test”, but it also misled the readers. According to the German Governmental Agency for Migration and Refugees, about 76 percent of the refugees who took the language test passed it. As listed in the full text of the article, the 4 out of 5 figure mentioned by Build did not refer to all refugees who took the test, but rather only to those who were illiterate. In an analysis by the Italian Committee named after the late British MP Jo Cox, hate speech featured at the second place, below hate crimes and above discriminations. 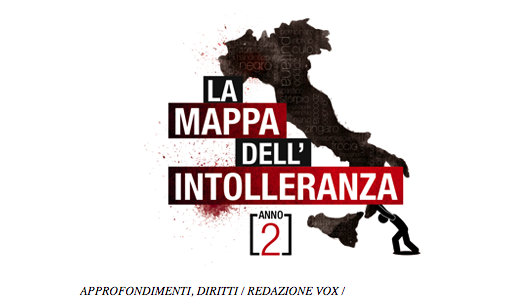 The document titled “The pyramid of hate in Italy” shows that hate speech off and online can be found at different levels of the public and political debate in Italy. When it comes to targets of online hate speech, according to the VOX Rights Observatory, women are the subjects of the 63% of all the negative tweets. LGBTQI community is targeted as much as migrants, almost 11% respectively. The findings further underlined the growth of far-right racist websites containing insults and offensive language directed to migrants, Roma people, Jewish people and Muslims. The Media Diversity Institute (MDI) is hosting a panel “Fascism is back. Is journalism part of the problem or of a solution?” at the International Journalism Festival in Perugia on 13 April 2018. The moderator of the panel on fascism and the role of the media is MDI Executive Director Milica Pesic. Her guests are well-known British journalist and author Yasmine Alibhai-Brown, an Austrian journalist and a fellow at the Reuters Institute for the Study of Journalism at the University of Oxford, Bettina Figl. Panelists are also Jean-Paul Marthoz, a columnist for a Belgian Le Soir and author of books on media coverage of terrorism and migration, as well as Belgrade-based Jovanka Matic, an experienced researcher in the field of communication, media and journalism studies in Western Balkans.